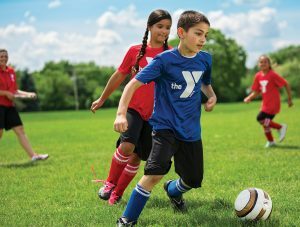 Get your head in the game with Spring Soccer at the Scott County Family YMCA. YMCA Soccer is designed to introduce the sport in a fun way to the youngest players and then continue to build skills, confidence and teamwork as the players grow. Practices will begin the week of April 15 with games on Saturdays, first one being on April 27. There will be six games and participants will receive a team t-shirt. In order to play all participants must wear shin guards at both practices and games. Cleats are not required but if your child chooses to wear them they must be soccer or all-purpose cleats. No baseball or football cleats please.